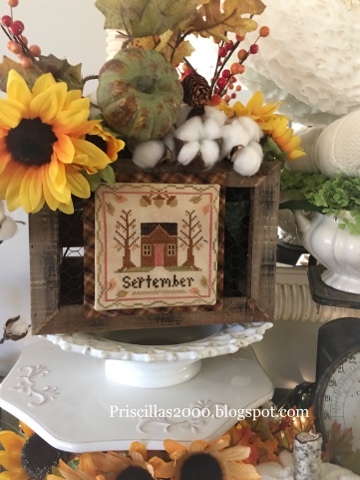 Can you believe it is September? Summer flew by ..but now we are upon my favorite 4 months of the year! I love to decorate for Fall, Halloween and Christmas! 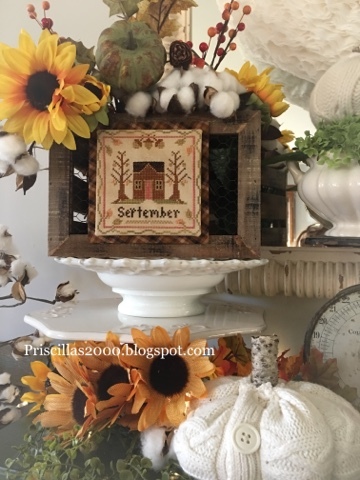 I finished stitching this September Sampler months chart pack ( includes the floss) from Classic Colorworks and Little House Needleworks, when we were on our road trip to Mackinac Island.. I didn't change any of the thread colors. Remember that little chicken wire crate I got last month at Michaels? I added a pumpkin pick and some fall berries to it.. Mounted the stitching on sticky board and then mounted a piece of plaid homespun on sticky board, glued those together and added a piece of sheet metal to the back to attach to the magnet I had put on the crate. 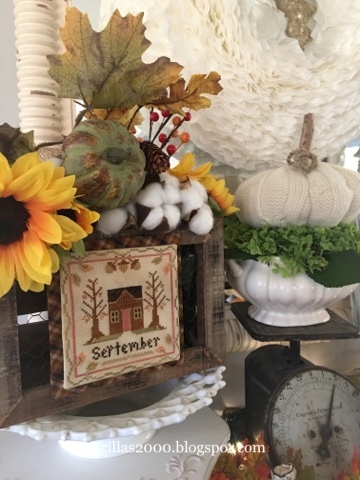 Easy ..but such a beautiful piece to add to my Fall decor.. I can hardly believe summer is gone (although I have to ask myself, "What summer?!" as it was so cool and rainy here the past few month). Today was a perfect Autumn day in SE Michigan! Your display is fabulous! 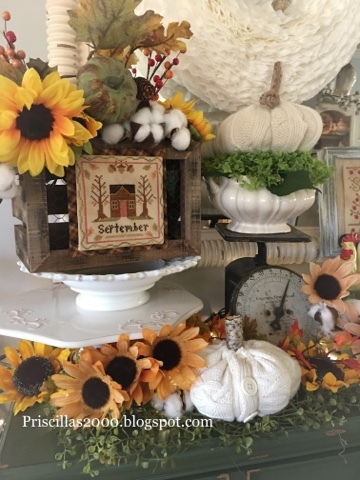 What a wonderful addition to your Fall decorating!! Love your Fall decorating Priscilla,especially the knitted pumpkin, it's gorgeous.Autumn in N.Z. is a lovely time as well, after hot Summers it's a lovely settled time of the year with some warmth still in it.I especially love the rich colour changes that happen. We are into Spring here now and picking daffodils and Camellias. The Lavender is starting to show some buds and wee bit of colour. I especially love Primulas, such delightful old fashioned looking. wee flower.Have a great week. Visit Priscilla's profile on Pinterest. Carrots and Cottontails Farm ! Rabbits and Chickens ..Oh MY! Super Mom - No Cape!